You’ve heard it before: Black goes with everything. There’s a strong element of truth to this sentiment; black is a neutral base, one that pairs as well with bold colors and patterns as it does with other neutrals. In other words, not much clashes with black. Your classic black suit will never go out of style, and you can confidently pair it with most of the shirts in your closet. That said, however, some black suit combinations work better than others. Here are some standout ways to style your best black suit, whether you’re getting ready for work, a date, or a formal event. The surest approach is to pair a black suit with shirts that are either achromatic—nearly colorless, in other words—or are colored in a very subtle hue. Go with your intuition here: Shirts in whites and pale shades often look best with black suits. There’s a reason why black tuxedos are almost always paired with white shirts, and it’s not just tradition: This is a combination that works. Let’s start with a classic: the black suit and white shirt. This pairing is so classic, in fact, that it can seem a bit bland, so the details are crucial to elevate this look above the ordinary. Make sure the cut of your suit is slim and modern. Fit and proportion are, as always, key; if you don’t want to look like you’re on your way to a funeral or auditioning for a community-theater production of Reservoir Dogs, make sure your jacket is neither too tight nor too baggy, and make sure your sleeves and hems hit at just the right length. A black tie is the classic option for this classic look, or you can shift the color balance by choosing charcoal, navy, or grey. A red tie will add a celebratory air, but make sure it’s the right red tie: Deep burgundies will look more sophisticated than tomato-bright shades. This is its own kind of classic pairing, and the gentler contrast of the black and blue gives you more room to play with tie colors and patterns. A cool, pale blue is the usual shade for dress shirts, though don’t overlook the appeal of navy: Navy pairs surprisingly well with black, and a navy shirt with a black suit looks fresh and unexpected. Shades of pink and lavender have become ubiquitous in menswear over the last couple of years, as men have finally figured out what women have known for years: These shades are insanely flattering to a wide range of skin tones. They also pair well with black, so this is a suit combination we wholeheartedly endorse. Add a tie in any color darker than your shirt—navy is a good pick—and you’re all set. Subtle patterns like slim stripes and small dots stand out well against the uncluttered backdrop of a black suit. A slim black suit matched with a patterned blue, white, or grey shirt is a sophisticated and work-appropriate look. If you’ve got a knack for mixing patterns, a tie in a big print that contrasts with your shirt—wide stripes against a shirt with small dots, for example—would make a bold statement; to play it safe, choose a solid tie in a color that coordinates with your shirt pattern. We began this piece by claiming black goes with everything, and while we stand by that statement, there are a few caveats: Bright primary and secondary colors—Crayola-ready shades of red, yellow, orange, blue, green, and purple—provide a stark contrast to black, which might not be what you want. Magicians and other performers often opt for a black suit-bright shirt combination for their stage costumes, because the contrast means it can be easily seen from the very back of an auditorium. While undeniably theatrical, this look can seem visually jarring outside of a stage, and thus should be avoided in everyday life. Some men look very good in head-to-toe black, though we’ll caution you that monochromatic dressing can be tricky: If you keep this look too minimalistic, you’ll look like you’re wearing a uniform. If you go this route, set yourself apart with carefully-chosen accessories. Think tasteful and upscale—a tie in lustrous black silk, a discreet pocket square in a subtle shade with a small pattern or print, the perfect cufflinks, a great gold watch—and proceed with confidence. A vest patterned in plaid, gingham, or houndstooth will create a welcome sense of depth when worn with a black suit. Avoid crayon-bright hues and pick a tie in a color or pattern that doesn’t compete with your vest for attention. A silk pocket square in a shade that complements the vest is a sophisticated final touch. That’s an easy one: Black. Black shoes are generally accepted as the best color to go with a black suit. That said, some fashion-forward men will pair a black suit with brown wingtips or dress boots in an effort to create contrast and color; if you think you look good in this combination, go for it. Just be aware that conventional wisdom says that black shoes are your best—and possibly only—option. 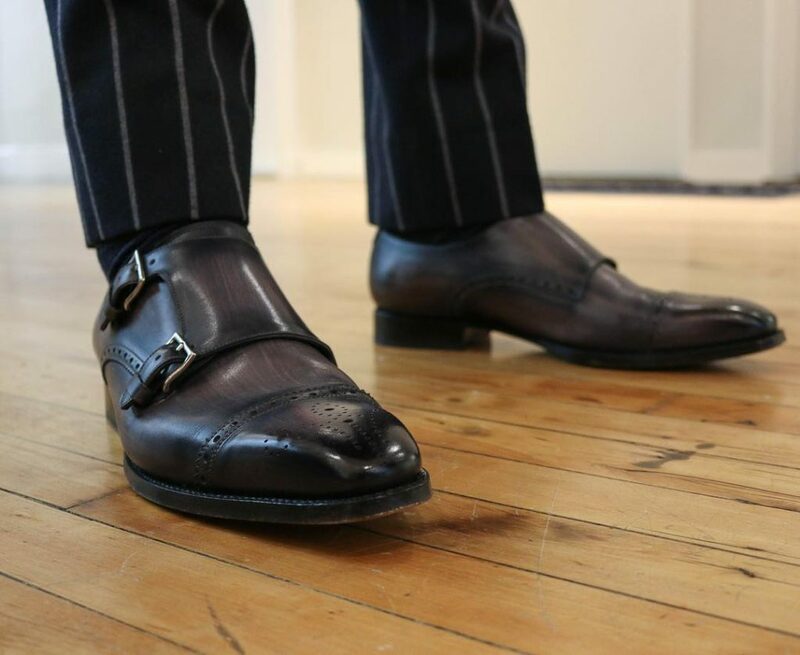 Make sure you pick a stylish dress shoe like an oxford or derby, or a black dress boot, such as chukkas or Chelsea boots. 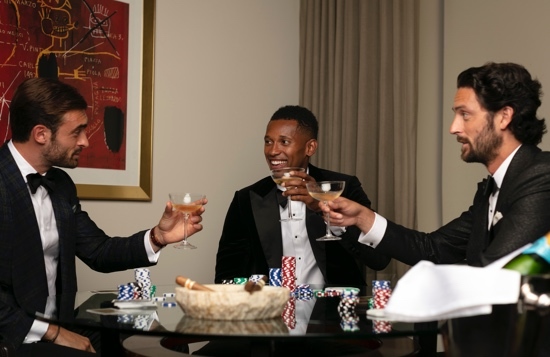 The black suit is an enduring staple of men’s fashion because of its versatility. Classic and fashion-forward all at once, it can be used as the base for anything from tasteful looks for the office to attention-grabbing statements on the red carpet. The right black suit is a perennial style favorite that you’ll reach for whenever you want to look and feel great. 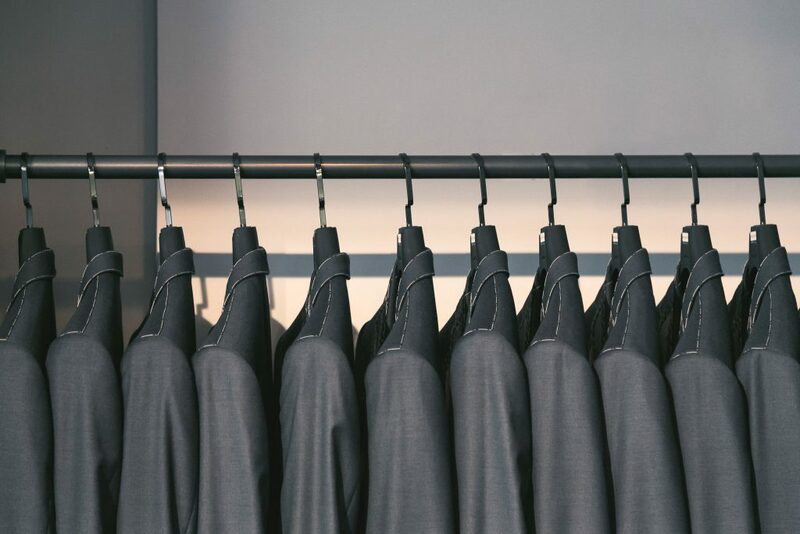 Visit a Knot Standard showroom to connect with a personal stylist who can help you design a custom-made black suit—or any other piece of clothing you’d like to add to your wardrobe—that will fit you better than anything else in your closet.